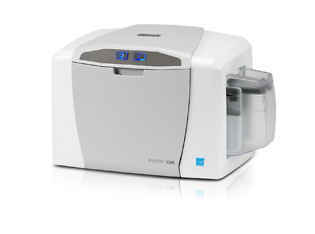 The Fargo C50 card printer is designed to print single-sided ID cards and badges on demand. Compact and easy-to-use, the Fargo C50 printer reliably issues high-quality badges at an affordable price point. The Fargo DTC1250e, DTC4250e and DTC4500e card printers are enhanced versions of the DTC1000, DTC4000 and DTC4500 models, and feature a 3-year warranty on printer and printhead. The Fargo DTC1250e card printer is the fastest plug-and-print solution in its category. Designed for small and medium businesses, the DTC1250e is a flexible solution to print professional badges on the spot. Powerful and ultra secure, the Fargo DTC4250e card printer is packed with unique features to simplify ID card production and ensure maximum card security. From standard printer password protection and fluorescent panel printing to Ethernet connectivity and encoding of technology cards, the DTC4250e is built to deliver secure credentials at all times. Designed for high volume applications, the Fargo DTC4500e card printer includes dual-input card hoppers and high-capacity ribbon supplies to maximize productivity. Modular and versatile, this printer offers field-upgradeable options such as card lamination to issue durable, tamperproof IDs. The new Fargo ID card printers are fully compatible with all operating systems, including Windows� 7, Windows� 8 (32 bit & 64 bit), MAC OS X 10.5/10.6/10.7/10.8 and Linux. To learn more about the new Fargo card printers, call ID Security Online at 1-800-897-7024 or visit IDSecurityOnline.com.